Are We Living In The End Times Or Last Days Right Now? 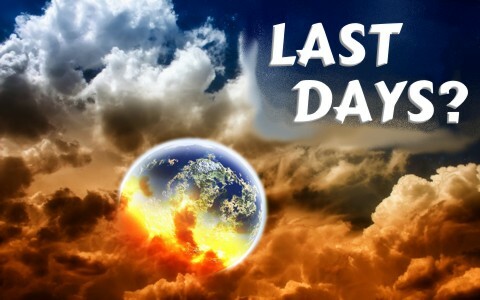 Are believers living in the so-called “last days” today? How can we know? Ever since the Second Advent or the Ascension of Christ back to heaven, people have believed that they were living in the last days so even in the first century church, most fully expected Christ to return within their lifetimes. In a way, they were right in the sense that judgment comes right after our last day and so in our own humanity, we are living in our own last days. We’ve got an appointment with death and no one knows when that will be and then comes the judgment of God (Heb 9:27). This is why Solomon wrote “do not boast about tomorrow, for you do not know what a day may bring” (Prov 27:1) and Jesus said “And I will say to my soul, you have ample goods laid up for many years; relax, eat, drink, be merry” (Luke 12:19) But God said to him, “Fool! This night your soul is required of you, and the things you have prepared, whose will they be?” (Luke 12:20). James writes that “yet you do not know what tomorrow will bring. What is your life? For you are a mist that appears for a little time and then vanishes” (James 4:14) so for all of us, these are our last days and that very last day may come surprisingly and unannounced. Jesus, in what is called the Olivet Prophecy, said that “as were the days of Noah, so will be the coming of the Son of Man” (Matt 24:37). What were Noah’s days like? Genesis tells us about the human state at that time, “The Lord saw that the wickedness of man was great in the earth, and that every intention of the thoughts of his heart was only evil continually” (Gen 6:5). So Noah’s days where days when mankind used every imagination in their minds to do evil and do evil all the time! So Jesus says will be the days leading up to the return of Jesus Christ (Matt 24:37) where “For as in those days before the flood they were eating and drinking, marrying and giving in marriage, until the day when Noah entered the ark” (Matt 24:38) “and they were unaware until the flood came and swept them all away, so will be the coming of the Son of Man” (Matt 24:39). In other words, no one saw the flood coming and few expect Jesus return today. Peter had already been hearing about the denials of Jesus’ return and wrote to the church that “first of all, that scoffers will come in the last days with scoffing, following their own sinful desires. They will say, “knowing this first of all, that scoffers will come in the last days with scoffing, following their own sinful desires. They will say, “Where is the promise of his coming? For ever since the fathers fell asleep, all things are continuing as they were from the beginning of creation” (2 Pet 3:3-4). In other words, scoffers and skeptics will continue to say “He’s not coming…everything’s just as it was and will be because your God does not exist.” Sadly, many will find out too late that Jesus Christ is real and He will judge the world in righteousness (Rev 20:12-15). As I wrote in the first paragraph, today are the last days for all of us since Jesus could return at any moment or we could die tonight in our sleep and then we face the judgment of God (Heb 9:27) but for those who have repented and believed, their sins were judged at the cross. Paul wrote “understand this, that in the last days there will come times of difficulty. For people will be lovers of self, lovers of money, proud, arrogant, abusive, disobedient to their parents, ungrateful, unholy, heartless, unappeasable, slanderous, without self-control, brutal, not loving good, treacherous, reckless, swollen with conceit, lovers of pleasure rather than lovers of God, having the appearance of godliness, but denying its power. Avoid such people” (2 Tim 3:1-5). Does this not sound like the days in which we live. It was quite possibly this way in Noah’s day too. People today are disobedient to parents, particularly children; people are arrogant, abusive, lovers of money and of self, proud, but are also ungrateful, unthankful, unholy, unappeasable (can’t satisfy them). Slanderous, and have no real self-control and are clearly brutal and hate that which is good. Just turn on the media, watch any movie in a movie theatre or on TV to see the brutal violence and sexually explicit images and profanity-laced language and you can see “that every intention of the thoughts of [mankind’s] heart was only evil continually” (Gen 6:5). I have no real idea on when the last days are. They appear to be today but so it did to the first century church. It does look a lot like what Paul told Timothy and Jesus referred to as in the days of Noah but for those who have never repented and trusted in Christ, you are the walking dead; you must be quickened by the Holy Spirit and made alive and then repent of your sins and turn to Christ and trust in Him. He will spare you from the wrath of God if you will only believe in Him. That is His desire. If you continue to reject Him, He will reject you at His second coming and you will spend eternity separated from Him (Rev 20:12-15). That is not His desire at all. I have learned some things about the bible I didn’t understand, thank you for this site. The last days/tribulation are jewish-centric. I think most get quite confused by trying to decipher things from their ego-centric view point. That is to say the Christian vantage point when in fact the last day are entirely judaism-centric. That is to say what is happening to the jews and when. When analyzing scripture that way it is much easier to determine where we are in relation to the last days. Previous post: What Does The Bible Say About Date Setters That Predict The End Of The World?